We're back! Due to the fact that the Christmas/New Year's holidays fell on the weekend, there was no HMAD screening in December, saving folks from having to hear me pimp Black Xmas (which is what I would show - and yes I mean the remake). But I'm making up for it - February's screening is already booked as well, and I'll announce the title at THIS month's screening, which is Psycho III! 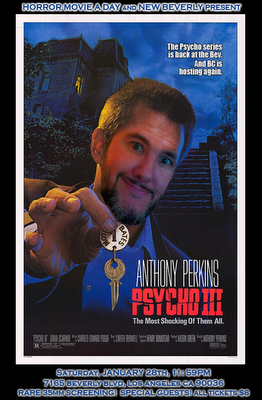 Some of you were probably at last year's Psycho II screening, which, while not typical midnight movie material, was a damn great time and won over a lot of fans. Psycho III, on the other hand, is PERFECT for midnight, as it adds a layer of sleaziness, has a higher body count, and... well, it's 20 minutes shorter. Always a plus, especially for serial dozers like me. We're still working on guests, but I'll have a TON of DVDs to give away, plus my usual rambling intro and the announcement of next month's screening, which I'm very excited about for reasons I'll explain when I'm up on stage. The screening takes place Saturday, January 28th at 11:59pm, and as always, you can buy your tickets at the door for 8 bucks (cash only!) or online at BrownPaperTickets. The New Beverly is located at 7165 Beverly Blvd in Los Angeles, 2 blocks west of La Brea. All the info is also on the awesome poster below, which I encourage you to steal and post about on your own sites/blogs/twitters/what have you. Let's pack this joint! Wow, wish I could be there! You're not by any chance somewhat excited because you are also showing the music video for "The Love Theme from Psycho III" which was a pretty crappy song shown as a preview at the end of an episode of Entertainment This Week back right before this was released to theaters?